The 1980s was a turbulent political period in Nigeria’s history. The decade witnessed the onset of national economic crises accompanied by the resulting implementation of economic reform, the structural adjustment program (SAP). The effects of the twin development manifested in massive retrenchment in the public and private sectors, increasing poverty, protests, and worsening environmental degradation occasioned by the unsustainable exploitation of crude oil in the Niger Delta. Contentious reaction against multinational oil company-induced environmental problems only began claim national and international attention in the early 1990s. Although some community groups had expressed disquiet about the dark side of multinational oil operations, it was the mobilization of the Ogoni people that brought the issue to the forefront. While working as an administrator at the University of Benin I had begun to develop a keen interest in environmental matters, and was taking practical steps aimed at environmental and sustainability awareness. Yet the unfolding struggle in Ogoni and dismissive reactions of the state and Shell failed to capture my imagination. Perhaps this was a result of an unconscious belief that the Ogoni agitation was legitimate and just. It was clear to me that the demand for a safe and clean environment was an issue the government should address in favor of the Ogoni. Even after Ken Saro-Wiwa and eight other Ogoni leaders were sentenced to death, I was confident that the convicted men would be set free. When news broke that the General Abacha military junta had executed the Ogoni leaders, on 10 November 1995, I cried. What kind of a country kills celebrated citizens for non-violently protesting against environmental degradation? I could not understand my country anymore! 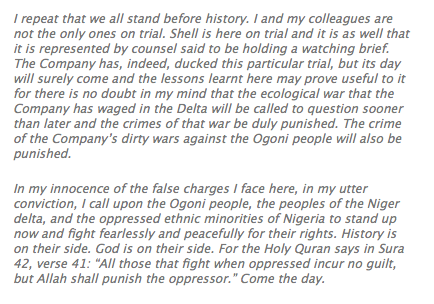 Final Statement by Ken Saro-Wiwa, Nigeria, 10 November 1995. I realized the depth of my trauma six years later as a graduate student at the American University in Cairo. When I was asked to develop a research proposal for a class on development and conflict, the only subject I could think about was the judicial murder of the environmentalists I never met. Subsequently, I wrote my MA thesis on the Ogoni and Shell conflict. The endeavor, rather than assuaging my feelings, only exposed me to a deeper knowledge and understanding of the grave injustices to which the Ogoni were subjected. I had been infected by the environmental bug! After completing my MA I headed to the International Institute of Social Studies (ISS), The Hague, for my doctoral studies. Again I wrote my dissertation on the Ogoni struggle, seeking a deeper understanding of the conflict through the application of social movement theories. Evidently, my interest in the environment revolved around environmental injustice or conflict over environmental resources. It is pertinent that the Ogoni struggle unfolded within a socioeconomic terrain overdetermined by neoliberal globalization. Neoliberal preference for non-state actors as vehicles for service delivery or better development surrogates led to the proliferation of environmental NGOs in Nigeria. They were imbued with the hope, which now seems misplaced, that better environmental governance could be achieved through civil society activism. The killing of the Ogoni environmentalists and apparent failure of the environmental community were further evidence of how ill-informed the idea of an effective environmental civil society was. Disillusionment with civil society activism, and perhaps abiding interest in the environment, shaped my research agenda at the RCC. I explored the state of environmentalism in Nigeria, and argued that the environmental NGO sector has been marginalized to the point that it can play only a peripheral role with regards to environmental governance. It could be argued that I arrived at the RCC with a Nunc dimittis for the death of environmentalism in Nigeria. Yet my stay at the center witnessed a sort of environmental rebirth. I met RCC fellows from across the world, whose research focused on issues that were very exotic to me: environmental history, history of earthquakes, history of the Danube River, and so on. The depth and diversity of seemingly “exotic” environmental humanities subjects spiraled when scholars from around the world converged in Munich for the European Society for Environmental History (ESEH) conference. My academic experiences barely prepared me for such a range of subject matters, which bear clear relevance to the present and future of African societies. I became acutely aware about the intimate connections between the environment and humanities. My environmental horizons immediately broadened to include environmental history, spanning environmental disasters, militarization, the environmental impact of crude oil, and petroleum product transportation. I also became keenly aware of the chasm that exists between the state of environmental humanities knowledge in Africa and the rest of the world. This is quite surprising given the rich history of significant environmental disasters, impacts, and human mediation of environmental crises on the continent. The gap should not exist, but it does, and something has to be done about it! My research interests and next project have been defined by the insights and contacts I have gained at the center. Hopefully the RCC and its global family will consider supporting the popularization of environmental humanities in Africa.